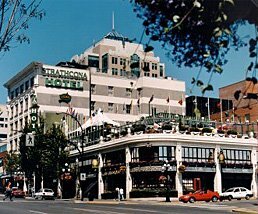 Although certainly neither luxurious nor quaint, the Strathcona Hotel in downtown Victoria is extremely convenient and quite inexpensive, especially in the off-season. Located jut behind the Hotel Empress, the Strathcona is close to the Royal B.C. Museum, the Inner Harbour, and other famous Victoria attractions and restaurants. Admittedly, the Strathcona has probably seen better days and perhaps lacks the charm for which Victoria is noted. The rooms are rather small and the walls are quite thin, but overall the hotel is clean and well-maintained. A complimentary continental buffet breakfast of fruit, muffins, cereal, and juice is served in the downstairs pub in the morning. Because the Strath is also home to five rather colorful pubs, including a seasonal rooftop bar, the hotel can be rather noisy and rowdy at times. The management at this family run establishment is very vigilant, but it is a good idea to ask for a quiet room. I read lots of satisfied customers reviews on Google about Strathcona Hotel. I am happy to read that they are offering best customer services with educated staff. I am a student of College and doing web design courses part time as I want to improve myself as professional with good skills. http://www.australianessay.com/ | essay writing service: The administration staff was extremely decent. The front work area was not prepared to handle the volume of individuals around the local area for different occasions. Their framework went down for a considerable length of time and they told clients it was their cards, they came up short on towels, and there is no Free WiFi which is normally a standard for inns in the downtown territory. Our room keys had quit working a few times. People have become less social in their lives. In old times, people had time for one other but now a day; people are so much busy in their tasks and activities that no one has time for anyone. People like to stat limited to their own circle. This review is well-balanced between the pros and cons, with some real insider tips. If you're looking for convenience and historical charm, if not absolute luxury, the Strathcona might be a great choice for you!